Tall Husband and I met Kim Hoegger, blogger/antique dealer, at her eponymous stall, which was full of all things white, green and natural. Her space was a garden dreamland. She had really original items...just look at those adorable life-sized garden children playing among the white blooms. 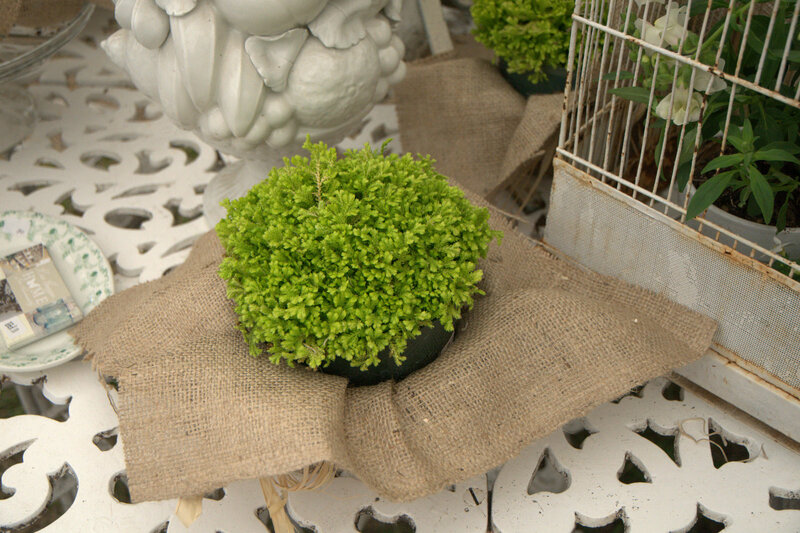 Here's an idea to steal from Kim: plants dressed in raw-edged burlap. Kim opted for potted plants instead of cut flowers so that she could have "something to take back home." Visit Kim Hoegger Home here. Ann Williams at Hill Country House has some great photos from the Marburger Farm Antique Show. Also, Maryanne, blogger/shopkeeper of Beadboard UpCountry, in Brenham, Texas, has great coverage of Round Top, Texas on her Blog. If you have photos of the big Round Top/Warrenton antique shows, send me your link and I'll put it on this post. I love Kim and her style.